Many people begin the year with the best of intentions and, as medical professionals, we love knowing that health-centered ones are very popular. 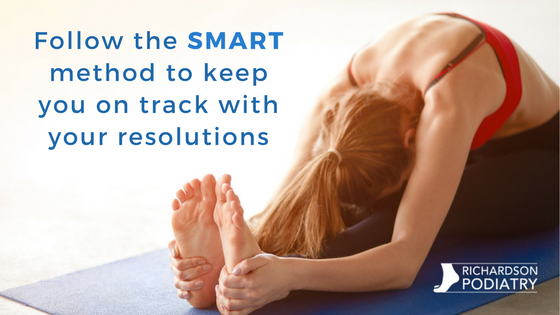 Sure, we provide exceptional foot care services, but we’d prefer to know you were able to stay safe in the first place – and many health-related resolutions help you in doing so. That said, making resolutions is a great starting point but actually following them is even better. Specific. “I want to lose weight” is a good thought, but “I want to lose 20 lbs. this year” is even better. While the former is vague, the latter gives an actual target (and a deadline, which comes into play in a little bit). Measurable. You won’t know if you’re making progress unless you choose a goal that can be measured. “I want to be a better employee” is a fine starting point, but you might want to keep fine-tuning your goal until you get to the point of “I am going to bring in ten new leads this year” (or something else that is applicable to your particular employment). Achievable. It doesn’t make sense to define a goal if it’s something you cannot achieve. Yes, it would be awesome if you could create world peace, but things of that nature simply aren’t realistic. Relevant. Goals are more likely to be accomplished if they are relevant to a larger mission. In the “Specific” example, losing weight can be relevant to better health and/or improved self-esteem. When choosing goals to pursue, think about how they fit into the bigger picture. Time-bound. There’s a great saying that “a goal is a dream with a deadline.” Having a target date to accomplish your goal serves to help keep you on track for success! Exercise. Hey, this is one you might have been planning on making anyway. When you do, it is important that you don’t jump into intense activity too quickly without taking the time to prepare your body first. Also, come see us and your primary care physician if it’s been a while since you last exercised on a regular basis. Remember, make your exercise resolution SMART! Not “I’m going to exercise more,” but something like “I am going to go for a 30-minute walk four times a week” (or whatever works best for you). Eat well. Don’t “go on a diet.” Even hearing those words can trigger something in your subconscious that might set you up for failure. Instead, commit to “making healthy dietary choices.” The phrasing makes a big difference. For one thing, diets are supposed to be limited. But what happens when the diet’s over? Conversely, you can—and absolutely should—make healthy dietary choices for the rest of your life. As another consideration, many traditional diets often have flaws (not enough carbs, too much carbs, they can be costly, etc.). Further, it’s too easy to view a diet as a “magic pill,” when there isn’t any such thing. Lose weight. Follow those previous two resolutions and this one will just fall into place! Shedding pounds—in a healthy manner—and then managing your weight is important for so many reasons, including the health of your feet. Put simply, the less you weigh, the less physical force your feet need to endure. You can make your weight-loss goal more achievable by breaking it down. Instead of “lose 24 lbs. this year,” aim for “lose 2 lbs. each month” (which is not nearly as overwhelming). Wear proper shoes. We aren’t going to tell you that you have to completely give up the high heels or sandals, but you should at least be reasonable with their usage. Stick to reasonable shoes for most of the time, and then treat yourself by wearing those “super cute” pumps on a night out. Get plenty of sleep. As a living being, your body needs time to recharge, replenish, and rejuvenate. This all happens when you sleep. Getting insufficient amounts of sleep disrupts your body’s repair processes and also messes with hormone production. An overwhelming majority of doctors recommend 7-8 hours of sleep every night – which is specific, measurable, achievable, relevant, and time-bound! Exercising, eating well, losing weight, wearing proper footwear, and getting enough sleep at night are instrumental in improving your foot health (along with your overall health!). Now, even achieving all of these objectives does not make you immune from foot and ankle problems. When issues arise, come see us at the earliest opportunity. We will create a customized treatment plan to resolve them for you. Contact us today for more information by calling (972) 690-5374 and one of our Richardson Podiatry Center team members will be happy to help you!